The Schack's exhibit gallery provides an up-close view into the fascinating world of glassblowing. From our hot shop window, you can watch working artists shape molten glass while admiring diverse exhibits featuring locally and internationally known professional artists. Admission is free. Click here to view the hot shop calendar and see if an artist will be working during your visit. 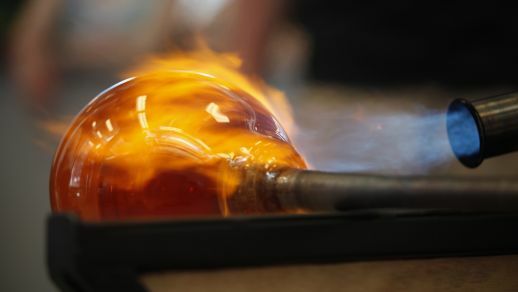 You can get a taste of glassblowing during one of our popular "Make it Now" sessions. Spend 20 minutes will our skilled team of glassblowers to create your own piece of glass art. All supplies are provided and reservations are highly recommended. Your project will be ready for pick up 48 hours later. If you're looking for a more in depth learning experience we offer glassblowing classes for all levels, including beginners. 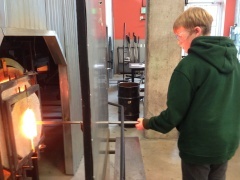 Check our class schedule to find the next "Glassblowing I" or "Single Session Intro to Glassblowing" course. Interested in Renting the Hot Shop? If you are an artist interested in renting our hot shop please visit the glass studios page to learn more about reservation rates and policies. Questions? 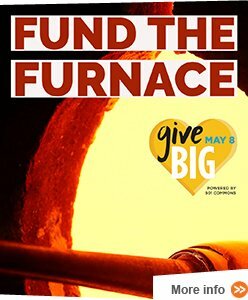 Contact Rich Langley, Glass Studio Manager, rlangley@schack.org or 425-259-5050 x22.